WINNIPEG — The Montreal Canadiens remained in the thick of a fight for a playoff spot after a 3-1 victory over the Winnipeg Jets on Saturday. 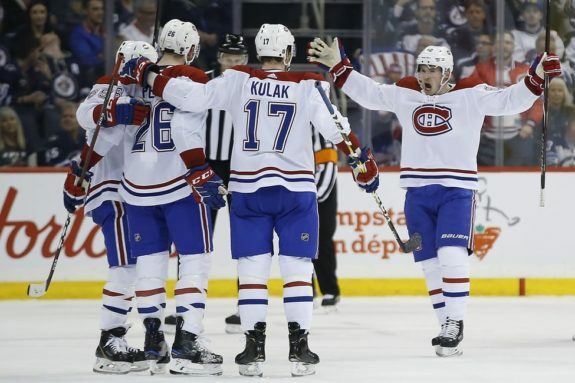 Joel Armia, Jeff Petry and Jordan Weal scored for Montreal (42-29-8) and Carey Price made 23 saves. Mathieu Perreault got the lone goal for Winnipeg, which has lost three in a row. Connor Hellebuyck made 40 saves for the Jets (45-29-4), who were tied for first place in the Central Division with Nashville heading into the game. Montreal controlled the play in the first period of Winnipeg’s final home game of the regular season, outshooting the Jets 16-5 and grabbing a 1-0 lead. Armia scored on his former team eight seconds after Jets forward Nikolaj Ehlers went to the penalty box for tripping at 16:57. The second period featured near misses by the Jets and another goal for the Canadiens. Montreal had a second power play eight minutes into the second period with Dmitry Kulikov in the box for tripping, but defenceman Ben Chiarot blocked two shots and Hellebuyck stopped Armia from in close. Jets defenceman Dustin Byfuglien, returning to action after missing the past 19 games with an ankle injury, hit a post late in the second and forward Kevin Hayes fired a shot that banged into the cross bar instead of the open net. Petry made it 2-0 with 37 seconds left in the second with a blast from the point. Max Domi’s assist gave him 70 points on the season. The Canadiens upped their shots advantage to 29-13 after the middle frame. Montreal got its third power play of the game early in the third when Jets captain Blake Wheeler was called for slashing, but Hellebuyck didn’t let the Habs pad their lead. Perreault scored his 15th goal of the season with 8:36 remaining after he got a loose puck on his stick in the slot and fired it past Price. Weal scored into the empty net with 16 seconds left. Winnipeg finishes the regular season with a three-game road trip, starting Monday in Chicago. Montreal hosts Tampa Bay on Tuesday.